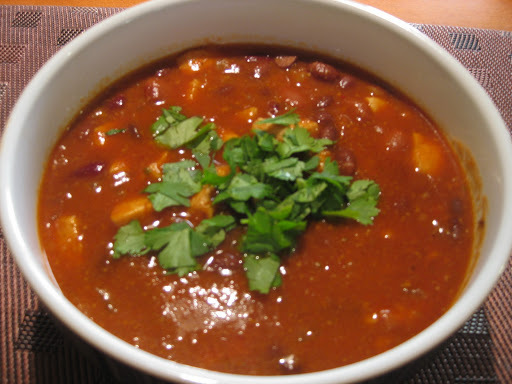 This recipe is taken from “The Best Recipes in the World” by Mark Bittman. Instead of the dried whole chilies, I used 1 1/2 tsp of chipotle chile pepper powder. I also just bought a cooked chicken and shredded it. This sauce can be made ahead of time. I used only one cup of the chicken stock since my sauce wasn’t super thick after cooking it. Instead of cooking my corn tortillas in oil I softened them in extra sauce that I warmed in a skillet. 1. Heat 3 tablespoons of the oil in a large skillet over medium heat. Add the garlic and onion and cook until softened, about 5 minutes. Add the tomatoes and chiles and cook until the tomato juices are released and the chiles are soft, about 5 minutes. Season with cumin, salt and pepper. 3. Preheat the oven to 350F. Meanwhile, heat the remaining oil in a deep skillet over medium-low heat. Cook the tortillas, one at a time, until softened and pliable, about 10 seconds. Drain on paper towels. 4. Line a heaping tablespoon of the chicken mixture in the center of each tortilla, roll tightly, and put in a large baking dish. The rolls should be placed snugly against one another. 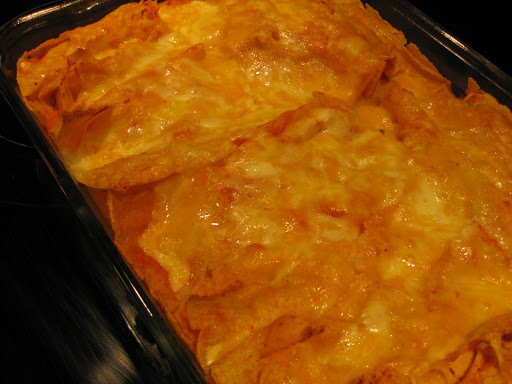 Pour the remaining sauce over, top with the cheese, and bake for about 25 minutes, or until heated through. Serve hot. Super easy after a busy day! This recipe is taken from The Best of Bridge, the Best of the Best and more. In the morning: Combine tomatoes, basil, garlic, olive oil, salt and pepper. Cover and leave to marinade on the counter. Dinnertime: Cook the pasta according to package directions. Drain and return to pot. Add marinated veggies (don’t drain) and cheese. Toss, cover. Set aside for 5 minutes, until cheeses melt. 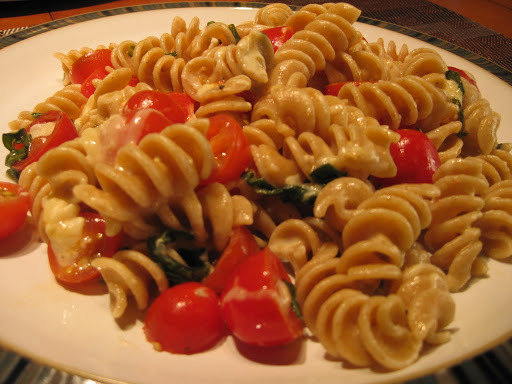 Place in your favorite pasta bowl and serve immediately. This recipe is adapted from Free For Dinner? The Montrose Street Ladies Dinner Cookbook. I could eat this salad every night it’s really good. Shake ingredients in tightly covered jar and refrigerate. Cook almonds and sugar over medium-high, stirring constantly, until sugar is melted and almonds are covered. Cool and break apart and store at room temperature. Tear lettuce apart. 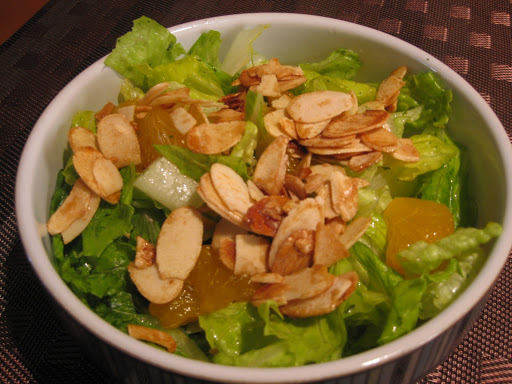 Five minutes before serving, pour dressing over lettuce and add mandarin segments. Top with sugared almonds. For this recipe I use 4 chicken breasts cut up. I have also used ground chicken as well. This recipe is from Food and Wine magazine’s “Quick from Scratch Chicken Cookbook. 2. Increase the heat to moderate and stir in the chicken strips. Cook until they are no longer pink, about 2 minutes. Stir in the chili powder, cumin, oregano, and salt. Add the jalapenos, the tomatoes with their juice, and the broth. Bring to a boil, reduce the heat, cover, and simmer for 15 minutes. For those who know me well, know that I give away a lot of my baking. These cinnamon buns however, never leave the house as my husband gets very upset if they do. So today is his birthday and I made him this recipe. It is taken from The Winnipeg Free Press Recipe Swap. It takes awhile to make these buns, but it’s well worth the effort. I found there was melted butter left over after brushing on the dough, so I used the reminder on the outside of the rolls. I also do not add the pecans. 1. In large bowl, dissolve 1 tsp white sugar in 1/2 cup warm water. Sprinkle in yeast and let rise for 10 minutes. 2. Meanwhile, heat milk with 1/4 cup white sugar, 1/4 cup butter and 1 tsp. salt. Cool until lukewarm. 5. Knead in remainder of all-purpose flour. Knead on floured surface by pulling dough out and returning pulled-out dough to the center, turn all dough counter-clockwise, add a bit of flour, continue the pull-and-turn to create elasticity in dough until you have used up all the flour. 6. Place dough in a large greased bowl. Turn dough over in bowl to grease all sides. Let rise in a warm place until double in bulk. 7. Melt 3/4 cup butter, 3/4 cup brown sugar, and 1 1/2 tsp cinnamon. Pour syrup into a 9 x 13 inch greased pan. Sprinkle chopped, toasted pecans on top. Set aside. 8. 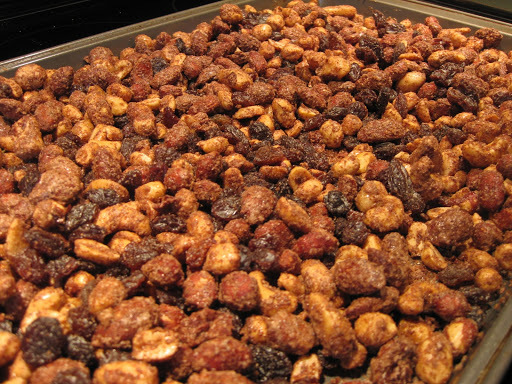 In a medium bowl, combine remainder of brown sugar, cinnamon, pecans and raisins. Set aside. 10. Roll out dough on floured surface. Spread with melted butter and sprinkle on brown sugar and cinnamon mixture. Roll up and cut into 12 buns. Place cut side up on top of sticky mixture in the pan. 11. Let rise in a warm place until double in bulk. 12. Bake in 350F oven for 20 minutes or until golden brown. Bake at 325F if using a glass pan (and it may need a few minutes longer). 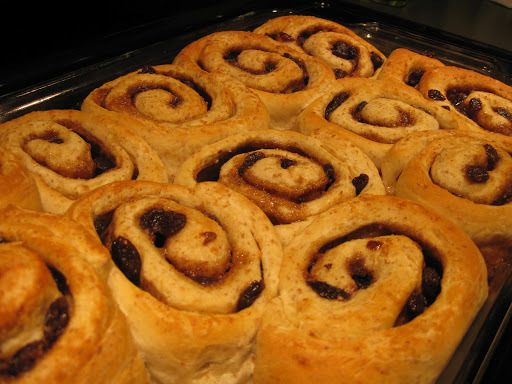 Allow cinnamon buns to set for 3 minutes. Invert on to a cookie sheet. Happy 60th Birthday Mom! I made this dish for her tonight. We both love Guy Fieri and what better dish to make then the winning recipe that won him the title of The Next Food Network Star. The flavors of the Alfredo sauce and the spice rub on the chicken is amazing. I wish this wasn’t such a fattening meal or I’d make it all the time! This recipe was taken from Guy Fieri’s Food -Cookin’ it, Livin’ it, Lovin’ it. 1. Preheat the oven to 350F. Bring a large pot of salted water to boil. Heat a large cast-iron skillet over very high heat. 2. Dredge the chicken breasts in the spice mix. Place in the cast-iron skillet. Blacken both sides of the chicken, 2 to 3 minutes per side. 3. Transfer the chicken to a baking sheet and place in the oven for 10 minutes or until the internal temperature of the chicken reaches 165F on an instant-read thermometer. 4. Remove from the oven and slice the chicken into strips on the bias. 5. In a large skillet over medium heat, heat the olive oil. Add the garlic and lightly brown it, 2 to 3 minutes. Stir in the wine. Pour in the heavy cream, bring to a simmer, and cook until the sauce is reduced by half. Add the sun-dried tomatoes, and chicken slices. 6. Meanwhile, cook the fettuccine al dente, according to the package directions. Drain. 7. When the sauce is at the desired consistency, stir in 1/2 cup of the Parmesan, the salt, pepper and pasta. 8. To serve, toss the pasta with the sauce on large rimmed plates. Garnish with 1/4 cup green onion and the remaining 1/4 cup Parmesan. 1. Combine all the ingredients and store in tightly sealed container in a cool place until needed, for up to 6 months. I have made this recipe with white wine, but since we are red wine drinkers I often use apple juice instead with no difference in taste. 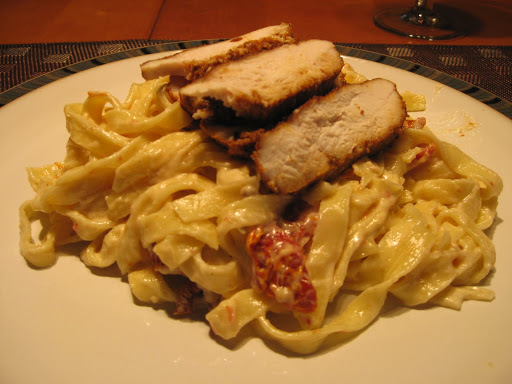 I have served this with rice but to switch it up I have used egg noodles and both are good. This recipe was taken from The Best of Bridge – The Best of the Best and More. Wash and pat dry chicken pieces. Put flour in plastic bag and shake chicken in it. In frying pan, heat oil and brown chicken. 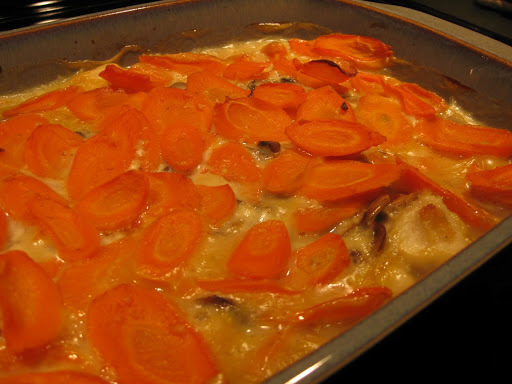 Remove chicken to large casserole. Cook mushrooms in butter and add to casserole. Combine remining ingredients; pour over chicken and mushrooms and bake at 350 F. for 1 hour. Serve over rice with a fresh green salad. Love this! The recipe is taken from “The Italian Way – Cooking with the De Lucas”. I used a food processor to finely chop the onions and to puree the tomatoes. The great thing about this recipe is that you can make parts of it ahead of time. 1. In a saucepan, heat the olive oil and cook the onion for 4-5 minutes over medium heat. Add the garlic and saute about 20 seconds. Set aside half of the onion mixture to use in the filling. To the remaining mixture, add the marjoram, or oregano, basil, and tomatoes and cook for about 20 minutes. Add salt and pepper to taste. 2. In a skillet, cook the sweet peas with the reserved onion mixture for 4-5 minutes or until peas are tender. Remove from heat and allow peas to cool (reserve 2 tablespoons for garnish). In a bowl, combine ricotta, 1/2 cup Parmesan cheese, cooled peas, egg, parsley, nutmeg, salt and pepper. Mix well and refrigerate for at least an hour. 3. Preheat the oven to 375F. In a large pot over high heat, bring water to a boil. Cook fresh lasagna noodles 1 minute, or cook dry pasta according to package direction. Drain and cool completely in cold water. Drain again then lay cooked noodles on a clean kitchen towel to dry. Spoon the filling, about 2 tablespoons, along the short end of each noodle and roll up. 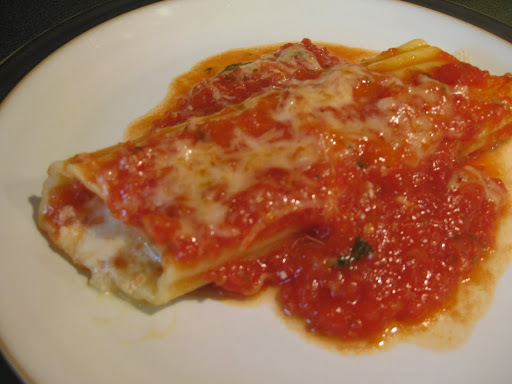 (If using manicotti shells, pipe the filling into the cooked shells). Place half the sauce in a 9×13-inch baking dish and arrange the manicotti in a single layer, seam side down. Top with the remaining sauce and sprinkle with Parmesan cheese. 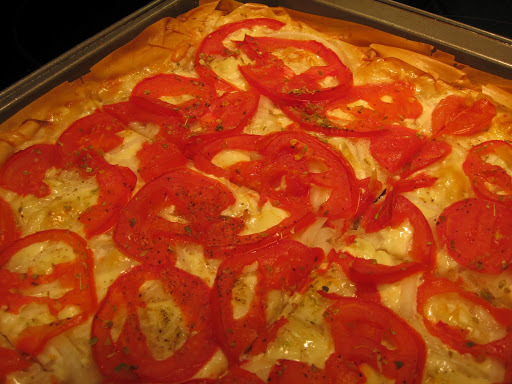 Cover with foil and bake for 25 minutes. Uncover and broil for 3-4 minutes, or until the cheese is golden brown. Remove from the oven, let stand 5 minutes, and garnish with reserved peas.